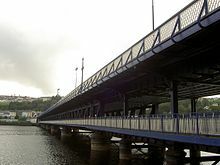 The Craigavon Bridge is one of three bridges in Derry, Northern Ireland. It crosses the River Foyle further south than the Foyle Bridge and Peace Bridge. It is one of only a few double-decker road bridges in Europe. It was named after Lord Craigavon, the first Prime Minister of Northern Ireland. The present bridge was designed by the City Architect Matthew A Robinson, construction began in the late 1920s and was finished in 1933. The lower deck of the bridge originally carried a railway line for freight wagons, but this was replaced by a road in 1968, and at each end a silhouetted mural of a railway station stands to mark the railway. On 3 July 1968, as part of a series of protests against housing conditions in Derry, the Derry Housing Action Committee (DHAC) held a sit-down protest on the newly opened second deck of the Craigavon Bridge. A pair of bronze statues forming a sculpture entitled Hands Across the Divide are situated at the west end of Craigavon Bridge in Carlisle Square and were produced by Derry sculptor Maurice Harron. Between October 1999 and August 2000, the Roads Service of the Department for Regional Development, in Phase I of a refurbishment project, concentrated on the refurbishment of the upper deck of the bridge to provide increased safety and to prolong the service life of the bridge. This included concrete and steelwork repairs, re-waterproofing of the deck to protect the steelwork from corrosion, resurfacing of both carriageway and footways. Later phases II and III concentrated on refurbishment of the lower deck and painting of the bridge. The total cost of refurbishing Craigavon Bridge was £4·2 million. Craigavon Bridge is one of three bridges to be built in the area. The first bridge over the River Foyle was a wooden one built in 1790. It was assembled in America and transported to Derry to be positioned in the Bridge Street area about 90 metres north of the present bridge. It was built from 1789-1791 between Bridge Street and Fountain Hill. The structure allowed for a drawbridge as the inhabitants of Strabane had navigational rights to the river. In 1863 the steel Carlisle Bridge was erected, a little further upstream, almost where Craigavon Bridge is today, to replace the old wooden bridge after it was destroyed after being hit by an iceberg in 1862. ^ "A Chronology of the Conflict - 1968". Conflict Archive on the Internet (CAIN). Retrieved 11 July 2009. ^ "Update on £1 million Craigavon Bridge Refurbishment". Department for Regional Development News Releases. 2000-05-05. Archived from the original on 2007-09-27. Retrieved 2007-08-23. ^ "Craigavon Bridge". NI Assembly Report. 2001-09-10. Archived from the original on 2007-09-26. Retrieved 2007-08-23. ^ a b "Craigavon Bridge". Richmond Centre - When in Londonderry. Archived from the original on 22 August 2007. Retrieved 2007-08-23. ^ "The Craigavon Bridge". Go Ireland. Archived from the original on 2012-07-08. Retrieved 2007-08-23. This page was last edited on 20 December 2018, at 23:48 (UTC).